Back in the days where WordPress is not that popular compare today, there’s a difficulty to create a new church website. If you want to have a church site, basic html template is needed to create a new one which you need to hire a web designer/developer. If you need to edit some contents of the site, you will be needing to contact the web designer/developer. It sounds like, it’s on the old age of typewriter that if you commit even a few mistake, then back to scratch. But today, life is going easier. With CMS (Content Management Software/System) like WordPress which powers most of church websites, there’s no reason for churches preventing them to have a website. With no advanced knowledge about web design/development, every church could run a site using WordPress. I’m not saying you don’t need web developers/designers, if you want to have a customized based on your preferences, you can request them for it with an additional price. But if you are satisfied to a simple solution, most WordPress themes are easy to customize regarding its fonts, color and other site elements. So, what hinders you to create a site for your church? Maybe the right choice that matches your church needs. I have a three simple tips on how to choose the right WordPress theme for your church. Design, features and speed. Design must fit your church needs. If your church is a modern or a classic one, it should match the theme that you are looking for, provided the fonts and colors are in harmony. It should have basic features like a manger for sermons, events, locations, staff, galleries and ministries. Some buyers tend to buy a theme because it is beautiful to look upon, but speed also matters. I know church WordPress themes may use multiple features or plugins which lessen its loading speed, but in spite of that, it should have a pagespeed score of not less than 50 from the popular speed testing site like Pingdom, Google Pagespeed and GTMetrix. Factors that affects speed on the theme are the number of plugins installed, server where the demo site is installed and the file size of the theme. So, what are we waiting for? 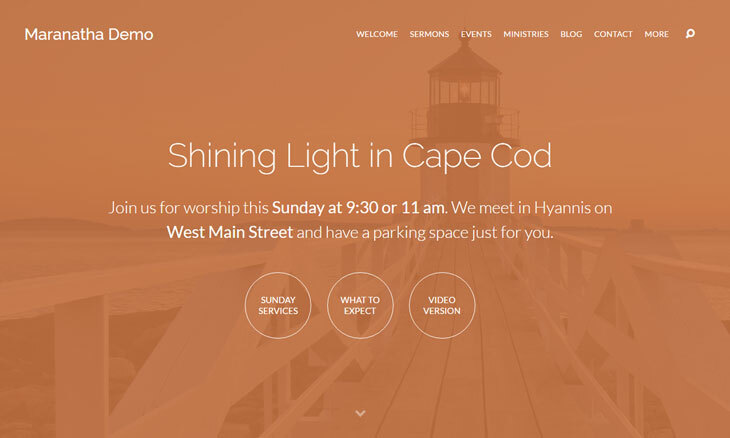 Are you ready to get the best church WordPress themes? Let’s explore for the best church WordPress themes that fits you church needs. Note: Tests may vary depending on the server used for pagespeed testing. Other factors might be affecting is, the number of plugin installed of the theme, the server of the demo site and if the demo site uses cache plugin, minification and CDN. The tests below are tested based on the demo provided by its authors. For fair tests, you may test the themes from scratch, without plugins, same server, same plugins installed. Lists are ordered randomly. Wise church is the wisest multi-purpose church WordPress theme. 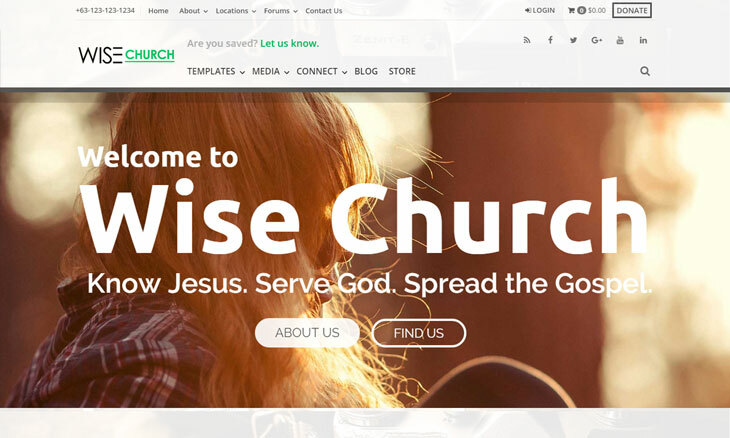 If you are looking for a complete church WordPress theme, Wise church is the wisest choice. 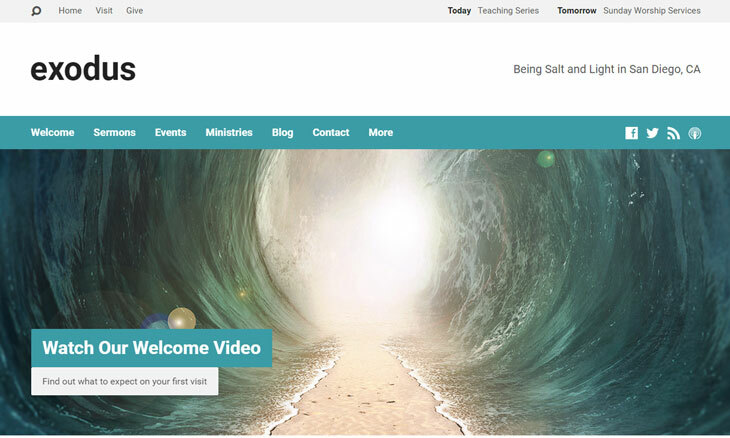 All themes might include church sermons, events, locations, staff, donations, ministries and galleries, but this theme is unique having a live streaming support and live chat which other church WordPress theme doesn’t offer. If you are going to customize and create homepages, you don’t need complex knowledge to build a one. Wise Church is using native WordPress widgets in repositioning homepage blocks layout which dramatically boost your church website’s speed. You also save $37 from its premium plugins which is Slider Revolution (a premium WordPress slider plugin) and Live WordPress Chat plugin. Aside from that, you can choose from 11 predefined custom preloader to help your church site more interesting. It also supports WooCommerce and bbPress to extend functionality of your site for a better ministry. It is faster than other church WordPress theme because it doesn’t uses external page builder, being small in file size and a versatile coding structure. Its design is simple but elagant. 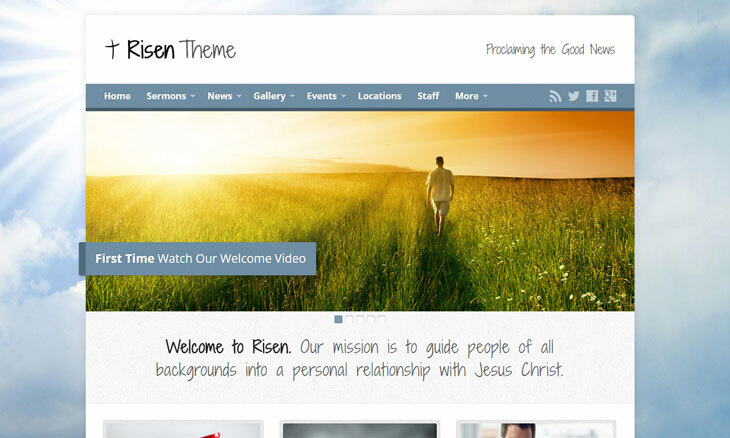 Overall, this is the complete church WordPress theme of a choice. The name Wise Church clearly pertains about being wise to choose and wise to live by fearing of the Lord, which is the beginning of wisdom. Maranatha is one of the finest church WordPress theme. It has a unique and a classic look church ministers will love to use. It also includes sermons, events, locations, staff, galleries and ministries that will empower church website. It is created by Steve Gliebe, the author of Church Theme Content plugin, which is one of the best church WordPress plugin out there. The name Maranatha of the theme is pointing out that Jesus is coming very soon. 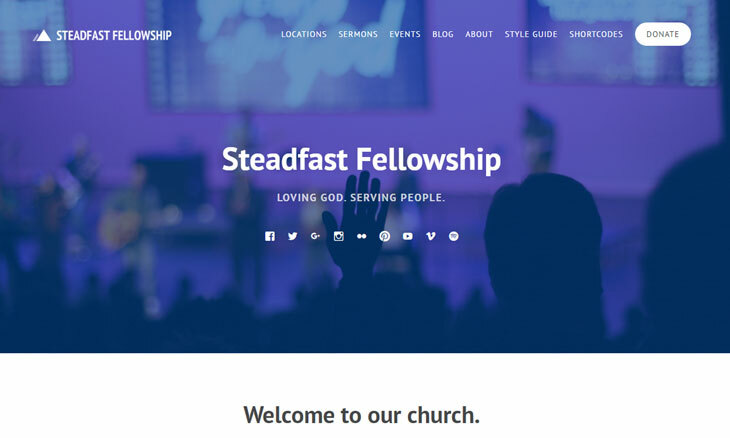 Steadfast is a also a clean looking church WordPress theme. Its design is minimal which is comfortable to look upon. 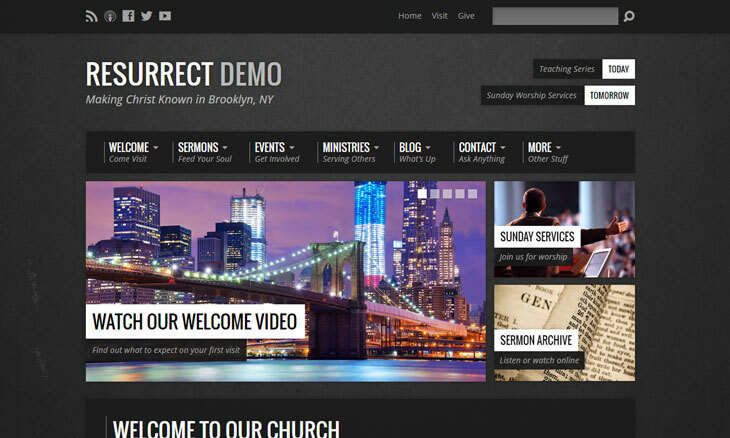 It also provides sermons, events, staff, locations, donations and uses Church Theme Content plugin. It is created by ThemeBright. If you need a church WordPress theme that has a minimal design, Steadfast is your choice. The name reminds about the steadfast love of God never ceases. 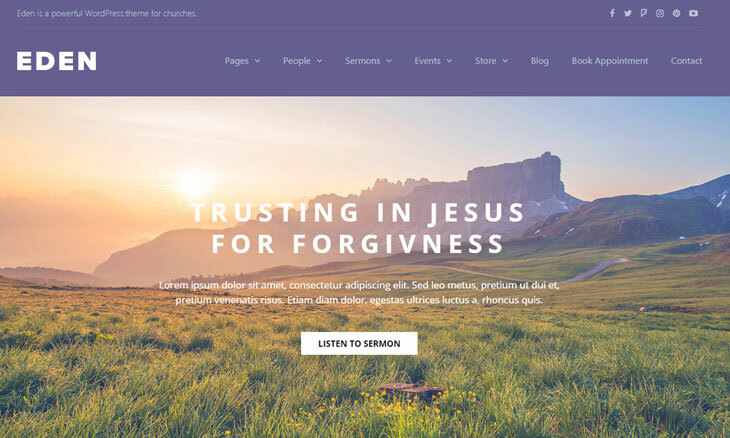 Exodus is a modern wide church WordPress theme created by churchthemes. It also includes sermons, events, locations, staff, galleries and ministries, powered by Church Theme Content plugin. It supports light and dark color of you choice, making it flexible with classic and modern church look. The theme name might be inspired by the book of the Bible, Exodus. Eden is a church WordPress theme created by BoxyStudio. It is simple but full-pack with features like manager for sermons, events and staff. It is also powered by Church Theme Content plugin. It supports WooCommerce and a premium slider included. It also has a free booking plugin from BoxyStudio. The theme name reminds me about the garden of Eden in the Bible. Resurrect is another product from churchthemes.com. It is an urban inspired church WordPress theme which provides sermons, events, staff, galleries, ministries, locations for your church. Its name reminds us that Jesus is resurrected from the dead. 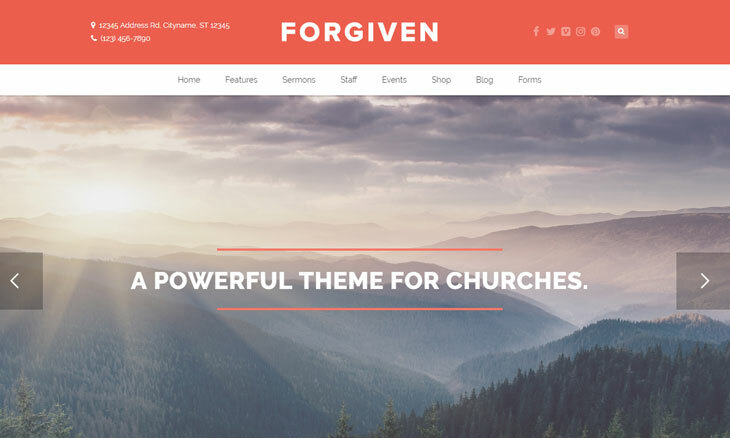 Forgiven is a church WordPress theme created by BoxyStudio. It is simple but full-pack with features like manager for sermons, events and staff. It is also powered by Church Theme Content plugin. It supports WooCommerce and a premium slider included. It also has a free booking plugin from BoxyStudio. The theme name is reminding us that God has already forgiven us through the blood of Jesus, by faith on Him alone. Risen is one of the best church themes from the time it is created. It is also complete with features which includes sermons, events, locations, staff, galleries and ministries that is best fit for churches. Looking at its design, it is refreshing and simple that will satisfy both site visitors and its site owner. It is also a product of Steven Gliebe, the founder of churchthemes.com. Its name proclaims that Jesus is risen from the dead. Great article, some of the best church themes. Nice idea to show speed scores. It would be interesting to install these themes on the same server to see how the speed scores compare. Thank you Steven, it’s a good suggestion. I am planning to do some tests in the future, but it would require to have a copy for each themes so I’ve just posted speed based on each demo site.